Explore the exciting and creative world of relief printing with linocut on fabric and paper! Artbarn School is providing all the materials including t-shirts! Make something special to wear this spring! Using the method of linocut we will transform your images into graphic form, producing bold, dramatic prints. You’ll create initial drawings, transfer them to the lino blocks, and cut away part of the surface of the flat lino block. The cut away block is then rolled with ink and the flat, raised areas are printed. We will explore black and white prints, multicoloured reduction prints and printing on fabric. Beginners are welcome, as well as those with experience in the medium; each student will receive individual attention at their level. Carving tools, lino blocks, inks, rollers, t-shirts, fabric and paper will be provided. Anne Abbass is a Toronto based artist printmaker who has been making prints for the past 25 years, ever since she was introduced to the processes while taking a Bachelor of Fine Arts at Queens University (1993). Anne has been an artist member of Open Studio Contemporary Printmaking Center for the past 20 years and currently sits on the board there. Over the years Anne has moved to more non-toxic and home studio friendly methods and materials. Her prints are created through the process of combining images, hand written script and areas of colour together. 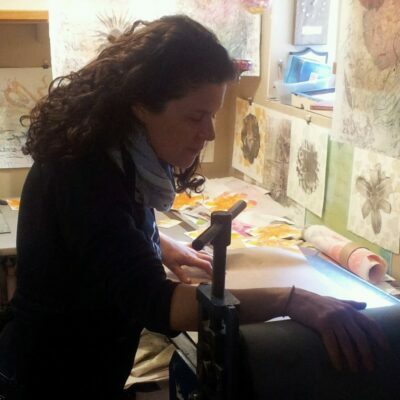 Several printmaking processes are used in each print, including monoprint, drypoint etching, and linocut.